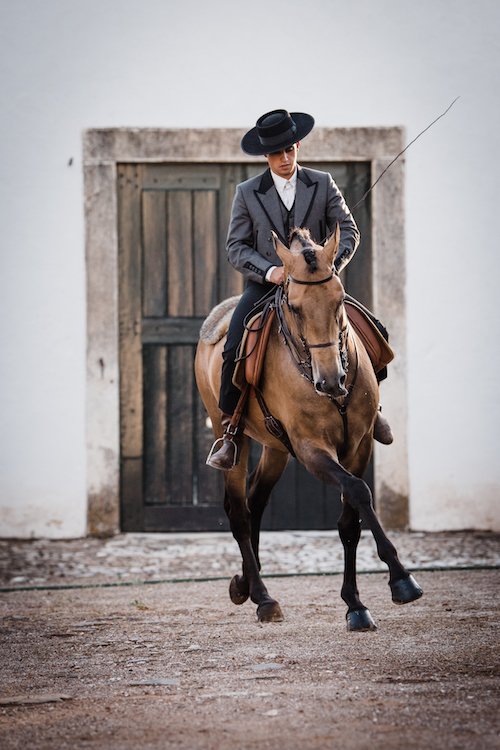 Portugal and it´s Lusitanos have a remarkable way of leading us into endless unexpected but always satisfying Adventures. This one to Ducal palace and the castle in Vila Vicosa was no exception. 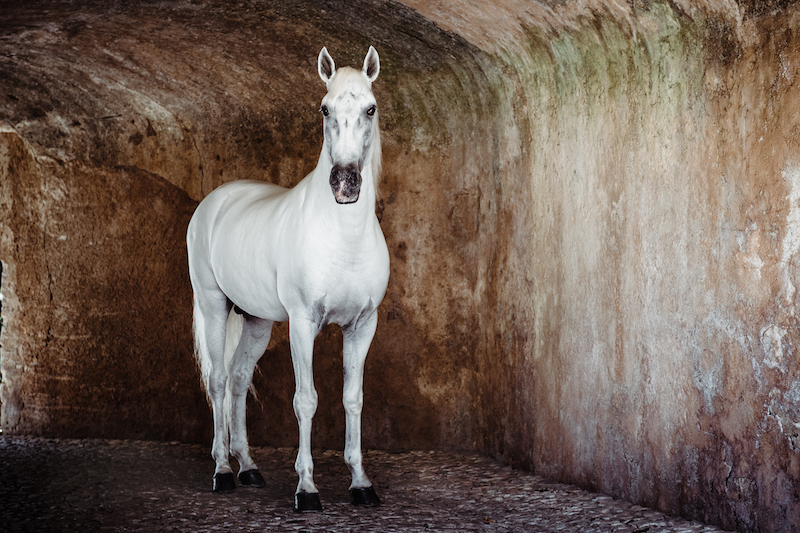 When I think of Equestrian Heritage it evokes romantic childhood dreams of ladies in fine dresses, knights in shinning armor, elegant carriages, white stallions, long manes and flowing tails. Great horses in harness turning the heavy soil or galloping across early morning dew soaked meadows in the pursuit of the wiley fox. Indeed equestrian heritage has always fascinated me. Now living in Portugal I´ve found myself immersed in a culture that has romance at it´s heart, which is found intrinsically intertwined all through the traditions, the art, culture, clothing, fairs and celebrations. equestrian centres, farms large and small. During all this I never for a moment imaged that I would be writing articles and having the wonderful opportunities I now have. I´m internally grateful. But my journey has not been alone, Lena Saugen a true and wonderful companion has traveled much of the road with me and without her many adventures would certainly not have happened. proved to be a fabulous and inspiring experience. As I am sure you are aware when planting a seed, nurturing it from the outset, it cannot fail to grow and with that growth it brings forth blossoming opportunities. This summer with the very kind permission of the Director of the Palace Dr.Maria we revisited this time to enter the Castle and the Palace. The day began at the small but embossing castle which over looks the town. 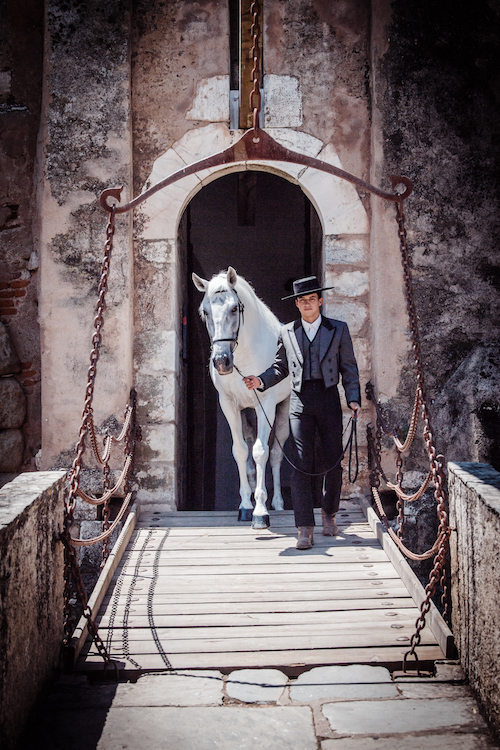 Pedro, the stud farm manager told us he had an ambition to photograph a horse on the castle drawbridge! A narrow bridge which expands over a very deep, now dry moat. The bridge is slatted thick wood with only chains on the sides and it moves a bit, it has to be said we were a little doubtful at the idea. How could we expect such walk of faith from a horse even if it is a Lusitano. It was only Pedro´s unfaltering confidence that convinced us to agree and so he proved it. Walking with Casanova beside him there was not a moment´s hesitation as they crossed the bridge. Casanova demonstrated to us once again the remarkable courage, trust and faith these horses have. He posed on the bridge with the professionalism of a top model. Two leisurely hours passed as Lena photographed the bridge, the tunnels and at the magnificent arched castle entrance looking down to the town. tusks are things you do not normally see. There is another small museum that has historical artifacts from the region including roman and prehistoric items you will see amazing incised slate panels from 2-3000 BC. Ducal Palace is located in the civil parish of Nossa Senhora da Conceição, in the municipality of Vila Viçosa, which is in the Portuguese Alentejo. It was, for centuries, the seat of House of Braganza, one of the most important noble houses in Portugal: it became the ruling house of the Kingdom of Portugal after 1640, until King Manuel II, titular head of the family, was deposed in the 5 October 1910 Revolution that brought a Republican government. The elegant royal stables are now home to an impressive collection of coaches, carriages and hunting carts, even the post carriage. Many are from the 18th century. 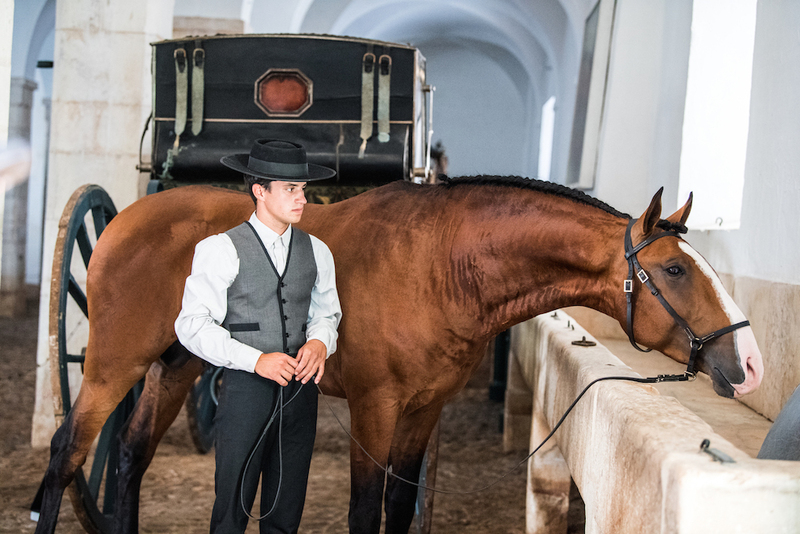 It´s really worth seeing and you can see the gala carriages from the 19th and 20th centuries. They are beautifully preserved and not to be missed is the amazing post coach, and the hunting and camping carriages. Later, after a quick lunch we arrived at Ducal Palace. 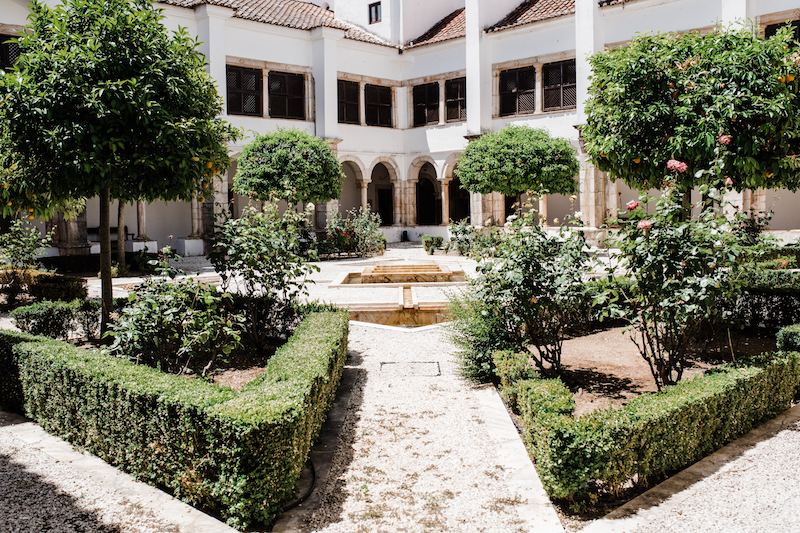 The impressively grand palace is owned by the house of Braganza, It´s a stunning example of Portuguese architecture. Built in the Mannerist style it has a 110 metre facade covered in marble from the region the over all effect is majestic in soft pink, cream and even appears pale blue. Inside there are more than 50 rooms most open to the public. On visiting you will find it´s a gold mine of historic artifacts and fascinating information on the region´s history, the Braganza family and Portuguese adventures. Everything is presented is a very accessible and attractive way. There are outstanding collections of paintings, sculptures, furniture, tapestries, ceramics and jewellery, including the biggest private collection of Chinese porcelain in the Iberian Peninsula. 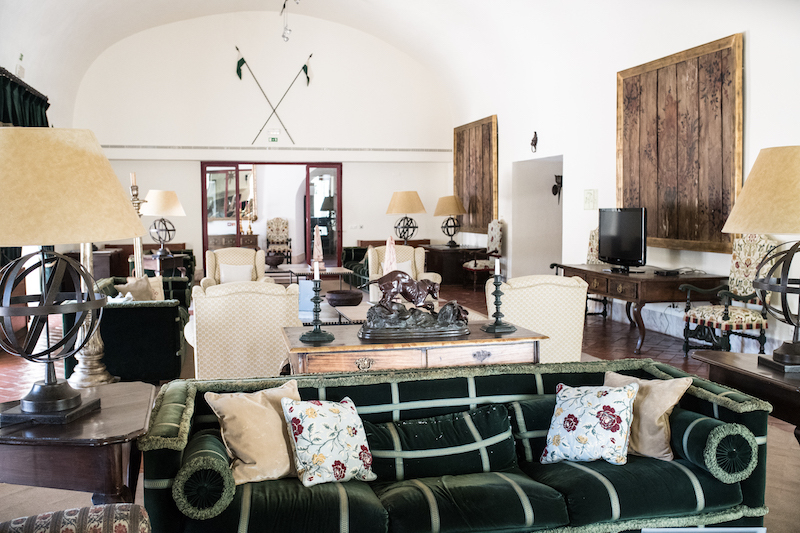 Look out for the Armory, exhibition with it´s extensive arms collection of the Braganza Dynasty and in the stables you will find a magnificent collection of coaches and carriages which belong to the royal family, including gala vehicles from the 19th and 20th centuries. 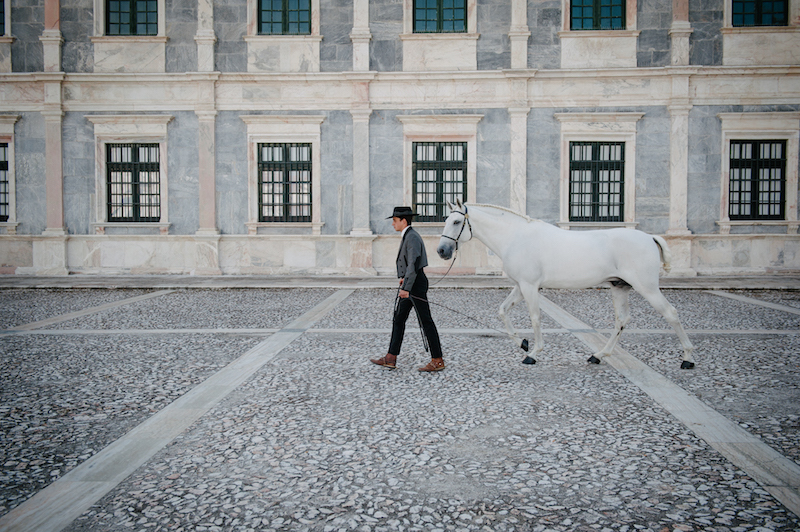 It was in these wonderful elegant stables we brought the stallions bringing a little equestrian life back. 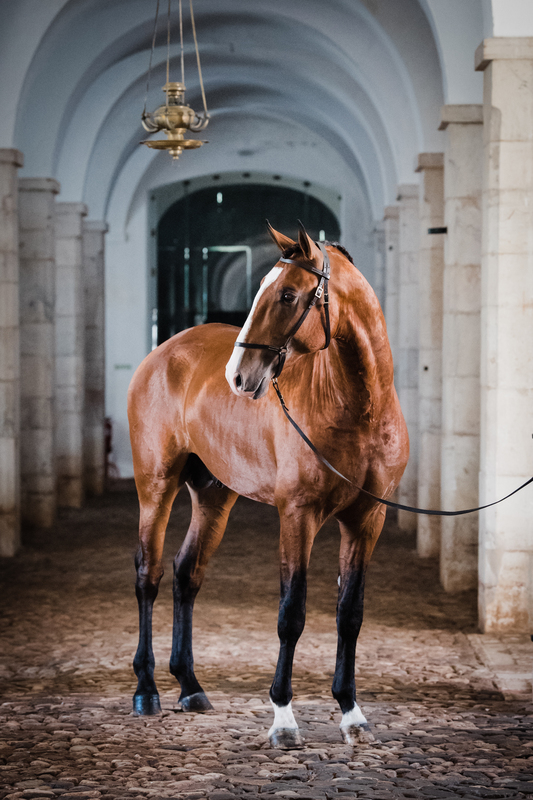 confided in us that there is a dream, an ambition in the air – she wants to bring the stables back to life with horse shows and traditional displays for visitors. I for one hope this will happen, I have no doubt it will be magical and will transport anyone watching back in time. After the stables we moved to the wonderful box hedge gardens at the centre of the palace. 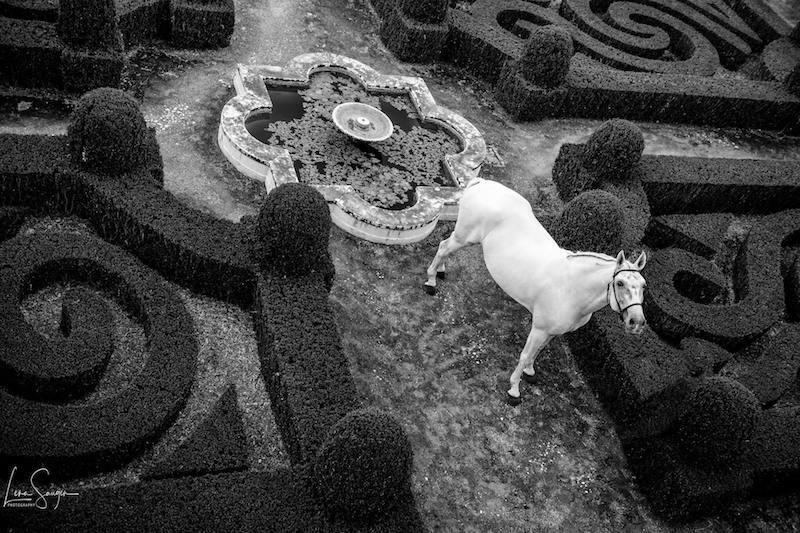 The topiary hedges are immaculately manicured lining a maze of pathways leading to fountains, sculptures and granite seats – you can imagine fine ladies once sat in private conversation. Or the king strolled along the paths dreaming his new projects, entertainments and hunting escapades in the Tapada Real (royal hunting grounds). The Tapada Real is located very close by and was once the largest natural walled space in Portugal, rich fauna and flora. Still today you can see the deer sitting under the expansive ancient oak trees. 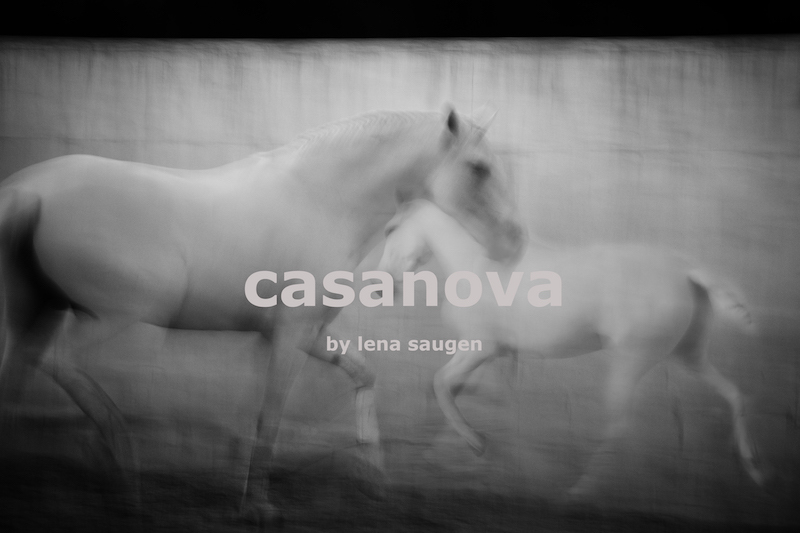 Lena had particularly wanted to photograph her muse stallion here the pure white Casanova, whom she has enjoyed a special photographic connection with for several years. 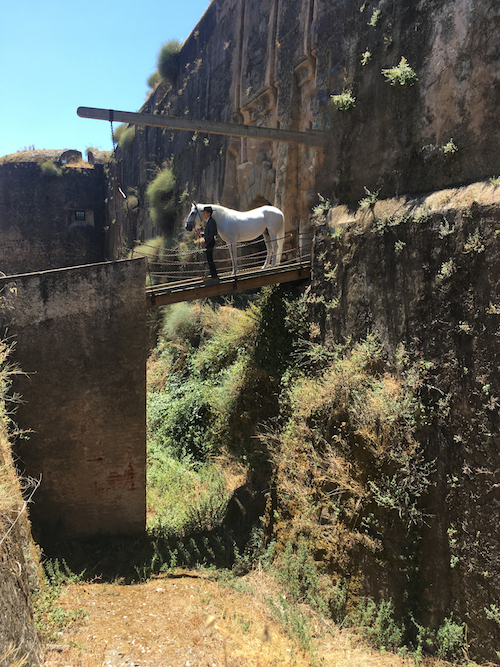 Having wowed us at the castle he continued to give that little bit extra in the gardens especially as he walked straight up to the top of some beautiful marble curved steps, he ascended like he had being doing it all his life. We were told the last time an official photograph was taken there it was the Royal family and no horse was in the image. Well Casanova is royalty in our eyes. The photograph of the Royal family in the same place can be seen in the Palace. All in all it was a perfect fews days, one never to be forgotten. and always treasured. Dr.Maria de Jesus Monge director of Fundação da Casa de Bragança at the Ducal Palace and Castle of Vila Viçosa for her support and enthusiasm. Lena Saugen for her amazing work, it never ceases to thrill! I cannot wait for further adventures with her. 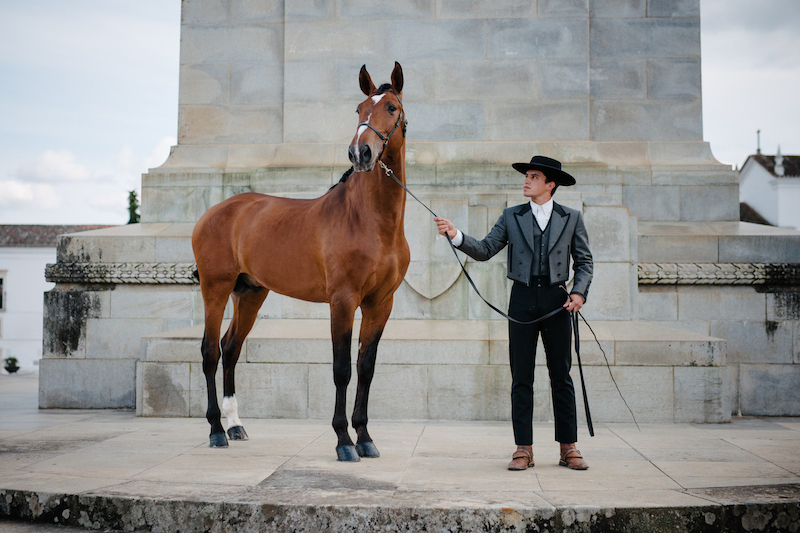 Coudelaria Vila Viçosa – for their energy, confidence, wonderful hospitality and of course their stunning Lusitanos. 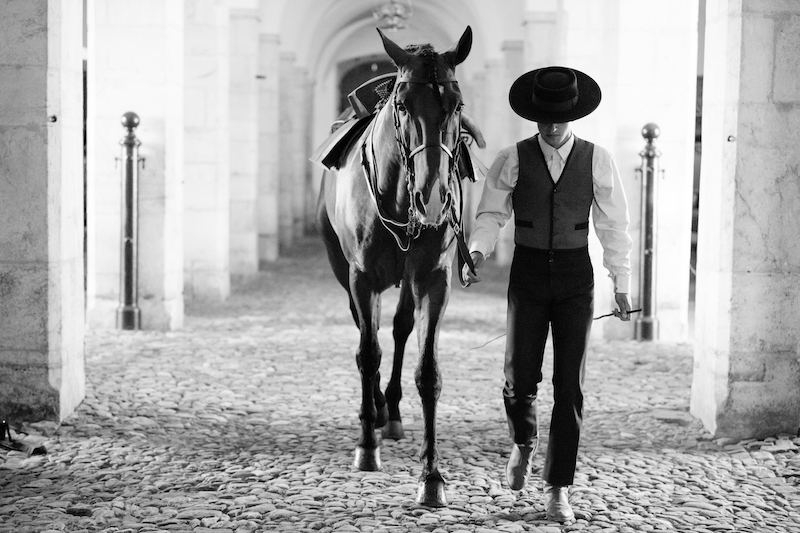 Fernando Lusitanos Pinho for his beautiful stallion. Special hug to Casanova who has actually been the ambassador of this journey and Lena´s muse. 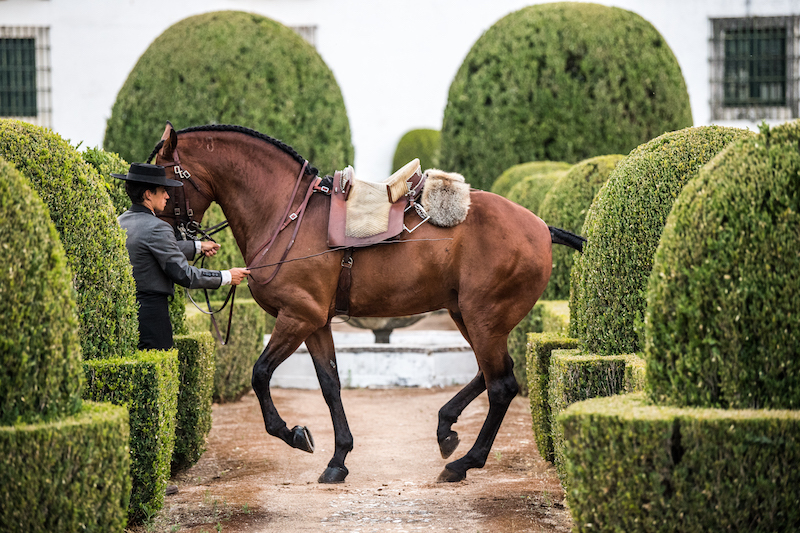 Consider putting an Equestrian Heritage Tour on your ´Must Do in this Life´list! 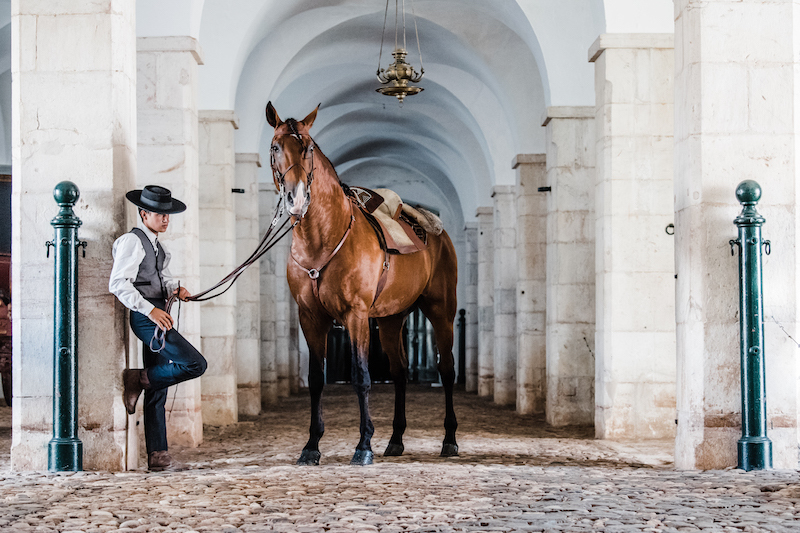 Why not take an opportunity just once to immerse yourself in the horses, culture, history, foods and wines of Portugal, I can assure you, you will not regret it. There is no doubt it feeds the soul and ignites your imagination. If you would like us to arrange a tour for you with your family and or friends then get in touch, we are always happy to help. If you want a place to stay in Vila-Vicosa check out the Pousada see details at the bottom of this page. Formerly a convent, this hotel near the historical village of Vila Viçosa is set in lush, landscaped gardens. It has an outdoor swimming pool, a spacious terrace and a restaurant.It is located right beside Ducal Palace. 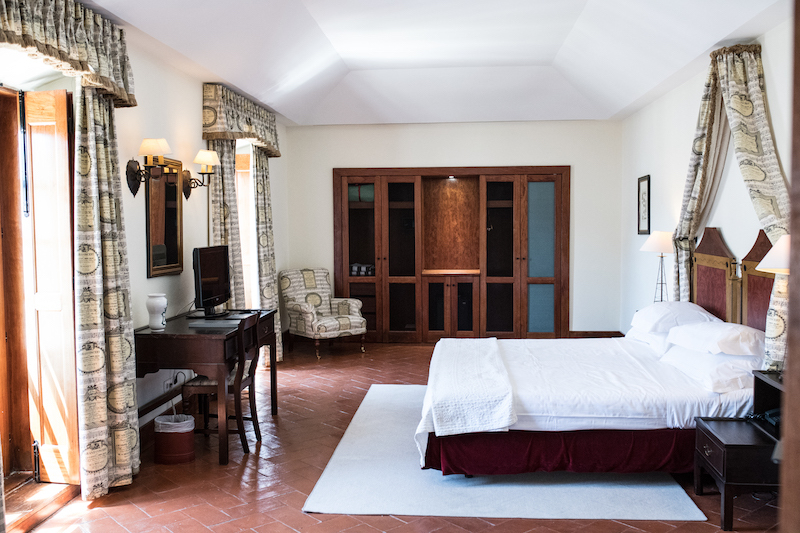 The elegant rooms at the Pousada Convento de Vila Viçosa are decorated in warm colours. They have wooden furniture, cable TV and a marble bathroom with a bath tub. Around the wonderful central courtyard there are arches and many have wall murals in soft colours and wonderful old tiles. 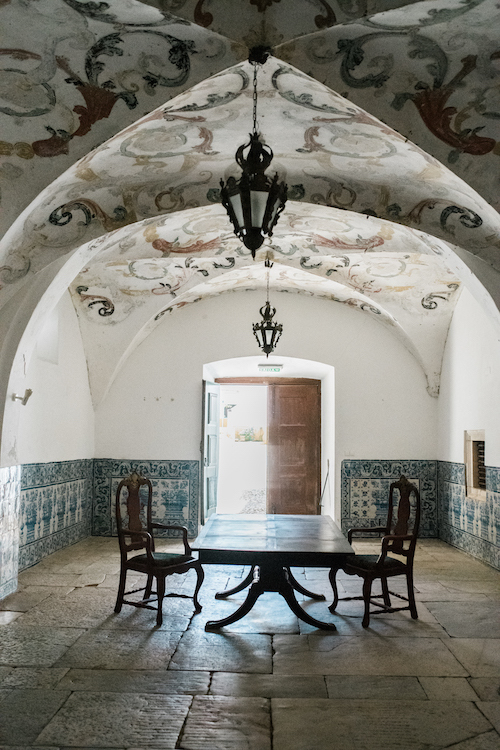 There´s spectacular entrance room with curved ceilings painted with floral scenes. It served as a reception room and at one time when it was still a convent people came with babies they could not look after and handed them to the Nuns via a wooden rotating hatch. Guests can enjoy meals at the restaurant, which serves authentic local cuisine and international wines. The lounge bar offers a casual atmosphere and serves light snacks and refreshing drinks. The Pousada Convento de Vila Viçosa’s outdoor swimming pool is surrounded by sun loungers and parasols. The spacious terrace is ideal for sunbathing. The hotel is 1 km from Vila Viçosa Station, and offers free parking on site.